Welcome to my Trip Report on Xiamen Air's final part! I woke up around 7 in the morning and checked out of the hotel half an hour later. Headed to the airport reluctantly as the thought of starting work the next day hunted me. During my time at the airport, I started planning for my next trip and more on that to come in my future trip report. Once I was at the airport, the check-in counters was not opened until 2 and a half hours before departure. This airline has neither web check-in nor early check-in at its home base, so I had to queue up early (15 minutes before it was opened) to avoid the long queue. Its a good thing as I was second in line and once it was opened, I waited less than 5 minutes to get my boarding pass and luggage checked in. I arrived at the departure hall for international flights at Xiamen Guoqi International Airport. This is for international flights, you need to go through the checking of passport and flight itinerary by the security guard before being allowed in. Checking my flight to check which row to check in. The check-in counters for my flight were not opened yet. Checking out the other parts of the departure hall (land side). Finally, the check-in counters were opened. Once I was done, I made my way to the air side. Nothing spectacular about this airport, but at least it has what most travellers need, that is free Wifi. However, you need a cell phone number to obtain the password in order to log in. After passing through immigration, I made my way to a cafe for breakfast. There are some shops at the air side, so you can do some last minute shopping before departure. I had my breakfast at this cafe, and it offers mostly western food such as sandwiches. The cafe was very quiet, with only a few of us enjoying the quietness. Got myself a cup of coffee and sandwiches - miserable portion. This meal cost me around U.S$10 plus. Once I finished, I went to the departure gate. Most of the passengers were locals, heading to Singapore for holiday. Need to charge your electronic device? There is a corner to do so. Later, I notice the arrival of my aircraft - B-5790, a two-years old aircraft with the Boeing Sky interior and flashes the airline's new livery. I am delighted to have flown both old and new livery of the airline's 737. 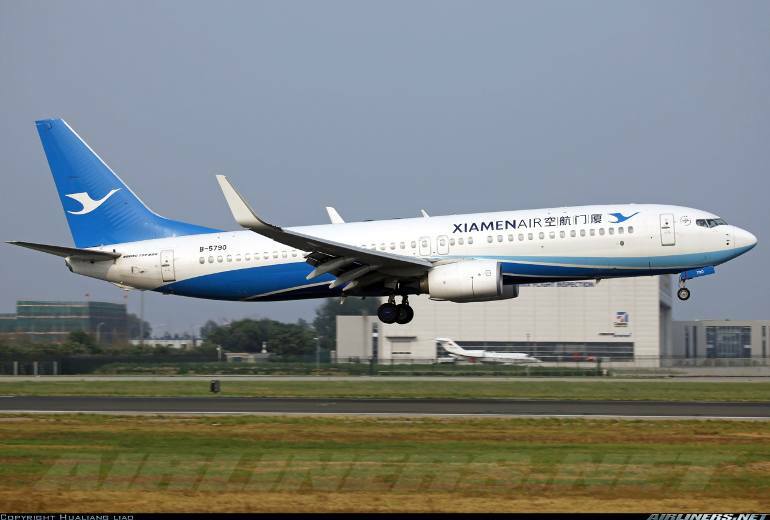 Notice the old and new livery of Xiamen Air? Which do you prefer? The aircraft flew from Zhengzhou and there were a few passengers on transit to Singapore. Refuelling was done at this airport so these passengers had to disembark. A set of crew was seen sitting at a bench while waiting for the aircraft to be cleaned and after 20 minutes, the aircraft was ready for boarding. From what I know, this set of crew was working on Xiamen - Singapore - Fuzhou sectors on that day. It was a tiring day for them, no wonder like the crew on my SIN-XMN sector, they were not very enthusiastic. Once on board, I was greeted by the purser and her crew. The crew near the rear didn't greet me when I walked past them. I was happy that I got the Boeing Sky Interior and at first I thought I got myself the whole row for myself, however that was short lived when a male passenger from the front moved to the aisle seat of my row. His friend wanted to sit at the middle seat and of course I stretched my leg to get the message across to him. I would have been pissed to have my additional legroom space taken away from me especially when they were other vacant seats available. The cabin seats are the same as the older batch of Boeing 737-800 (Non-BSI). Boeing Sky Interior does help enhance the ambiance of the aircraft interior. I am surprised such a big box like this is not checked in. Bulkhead row - legroom space doesn't seem spacious. The cabin crew's work space and their cabin luggages at the overhead bin. I am a big fan of this lighting. Unlike the Boeing 787's cabin, this doesn't offer the colourful lighting. My window seat. Unfortunately, I couldn't get the whole row to myself, I wanted to take a nap, but this gentleman strike a conversation with me and asked me questions which the tour guide could answer. For the last hour of so, I spent the time talking to him even though I felt slightly drowsy (tiredness) towards the end. Not being anti-social, but I would have preferred to be left alone to rest at that time. While more passengers were settling down and the crew were in front helping out, I took more shots of the interior. The lack of IFE system is obvious and you need to bring your own entertainment such as Ipad along. My In-Flight Entertainment System for this flight! Enjoying one of the Fast and the Furious movies. A few passengers managed to get the whole row for themselves! I was disappointed especially with that passenger moving to my row. Legroom space is the same as the previous Boeing 737-800 aircraft I was on. The last row of the aircraft - the seats can be reclined. The cabin crew weren't the most friendliest among my flights, but they were helpful at least. They could be more interactive with the passengers, but at least they were professional when the passengers pressed the crew's button. Once everyone was seated, the crew came around to do their check. Not long after, the aircraft pushed back and we sat at the remote parking lot for quite a while, waiting for clearance to take off. This took around 15-20 minutes, and I noticed the aircraft beside our aircraft were cleared to leave one by one. Finally our turn came, and we taxied to the runway then took off. I suppose instead of letting the aircraft waste fuel while queueing up, the aircraft parked until their turn to depart came since the remote parking lot was not far from the departure runway. Take off was a bit turbulence but it wasn't as bad as the descending towards Singapore, the flying through clouds was quite bumpy but the conversation with my seat mate got my mind off that, but I do remember a few of us went "Woooooo" when the aircraft dropped a few metres. After half an hour of flying, the preparation of serving us of meal began and first we were given wet tissue. Followed by a bottle of drink and a packet of peanuts. I had 4 packets of it after collecting them from my previous flights and yes - I don't eat nuts. Not a fan of it! Not long after that, our meal was served. The crew didn't take long to reach our rows, starting from the middle. We get a choice of fish or pork. I chose the latter. The box contains bread, fruits and coconut cake. The meal was decent, nothing much to shout about. I had the Coke for my drink. After the meal, I watch the movie on my Ipad before chatting with the seat mate for the rest of the flight. The weird part is he was asking me questions that the tour guide could help, not knowing to him that I wasn't really in the mood to socialise and was still feeling a bit sore about him sitting where he shouldn't. Nevertheless, the conversation didn't turn out too bad and before we knew it, we were on the ground. Ground engineer checking to make sure everything is good. We were stuck here for about 15 minutes waiting for clearance for take off. Once clearance was given, we taxied towards the active runway, passing by the Boeing 737s. We were soon at the threshold, and was cleared to take off. Passed by some clouds before the seat belt sign was turned off. We were cruising across the South China Sea and it was smooth for most parts of it. Approaching Malaysia Peninsula and it was cloudy and not to mention the haze when the aircraft touched down. It was quite bumpy at this point. Flying was smoother after clearing the clouds. The approach to runway 20R was smooth. Touched down on runway 20R in hazy condition. Passing by the common subjects. We finally reached the gate almost 5 hours plus on the aircraft, this is my longest flight on a narrow-body so far. My previous record was on China Northern's Airbus A321 ride on this same route, you can check out the trip report over here. My overall experience of this flight as suggested is the lowest among the 4 flights, don't expect anything spectacular when flying with this airline. 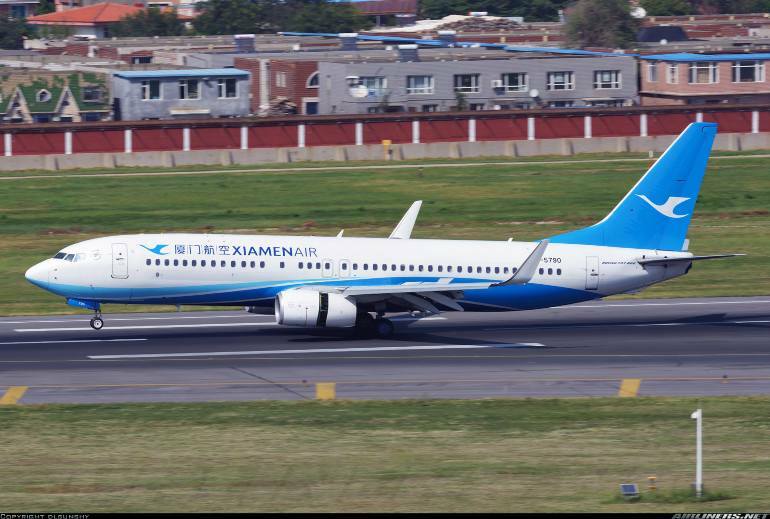 Its a typical Chinese carrier offering the essential need and that is to transport passengers from point A to B. Comparing with the bigger airlines, it feels like a Low Cost Carrier in terms of cabin product and website. If it can sort the website out, improve the cabin comfort and the service, it can compete with the better airlines out there. The airline's Boeing 787 Dreamliner on the other hand is a different story. This aircraft is the only wide-body in the airline's fleet which offers in-flight entertainment and uses better seats than the 737 and 757. 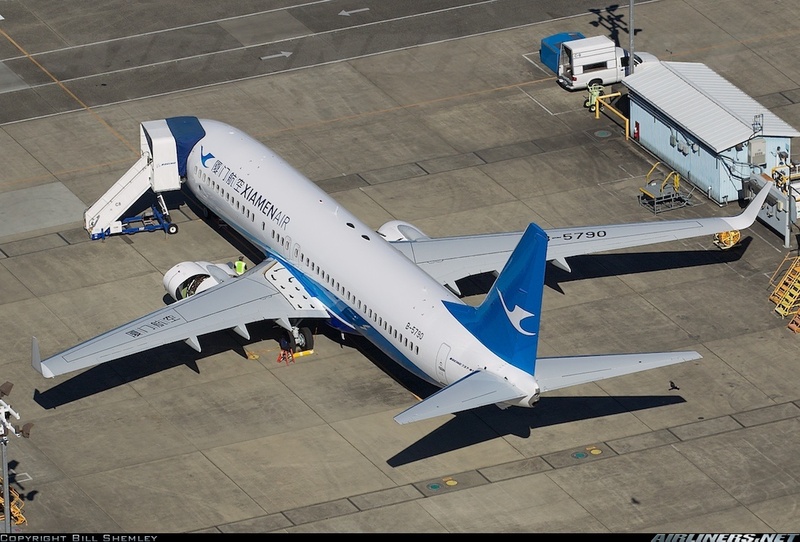 Don't expect to fly this aircraft type on South-East Asia routes to China, as its operated by the Boeing 737-800. Overall, for the money I paid, I can't complain. At least the flights were mostly on time and the food portion is pretty generous. You can be assured of reliability when flying with this carrier. Thanks for reading! This marks the end of my trip report for my September 2015 trip.